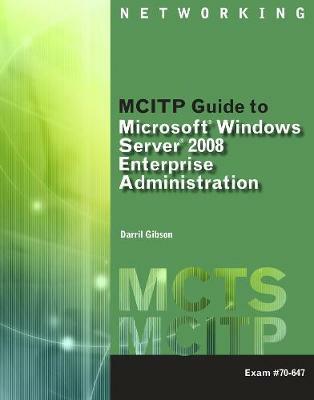 MCITP GUIDE TO MICROSOFT WINDOWS SERVER 2008, Enterprise Administration (EXAM #70-647) prepares learners to develop the skills necessary to manage Windows Server 2008 in an enterprise environment and to successfully take the MCITP 70-647 certification exam. Comprehensive coverage includes designing Active Directory domain services, DNS, group policy, remote access, security, business continuity, and virtualization. Extensive hands-on activities and review questions reinforce concepts and prepare readers for the real-world challenges of network administration in an enterprise environment.